I got back to Malaysia on 12th March. 4th day of the missing plane. Still no news. Why? There’s a lot of assumptions on FB. Crashed into the sea. Hijacking. Crashed in Penang. Crashed near Malacca. Landed in India. I'm reading there are total of eight possibilities. So many assumptions! The latest I read was India has joined the search and now searching around uninhabited jungle islands. Making them the 12th country to assist on the search. Did they went in to the time tunnel?? Such thing really exist? Whatever the reason is, I hope all 239 of them on the plane are still alive and safe and will go back to their family soon. so, u have deleted my post eh? its ok. i can post it again. in fact, this whole post will be in my blog, so that in case if this post is missing again, i can just easily look it up and repost it. u saw that photograph of watermelon? looks pathetic eh? lemme REMIND you what happened on 30th jan.
we went to kim gary sunway branch and there was about 8 of us for supper. and of cos we ordered meal sets. we were being advised that the borsch soup is finished and your staff advised us that it will be replaced with fruits. we were more than happy to accept it because fruits are of cos a more healthier option. 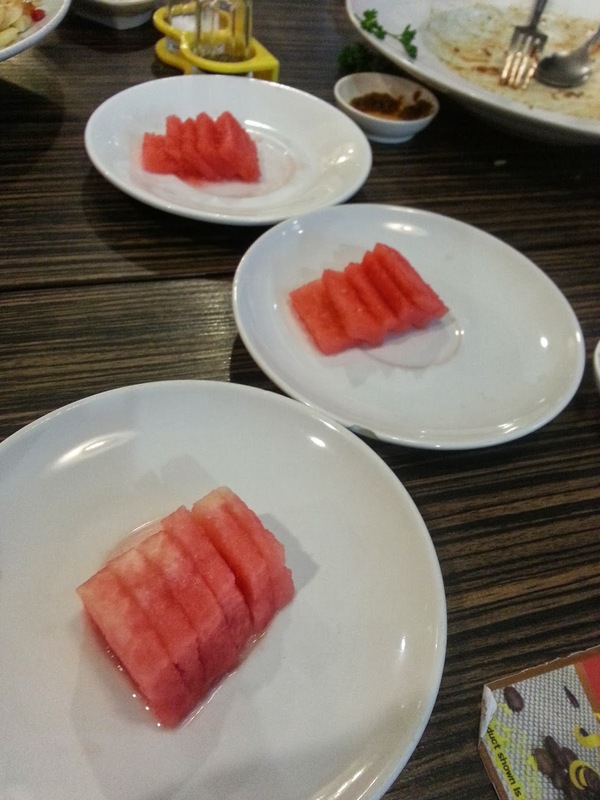 but to our surprise, we were being served with these pathetic looking watermelon. if i am not mistaken, your borsch soup costs approximately RM4. does that plate of watermelon look like RM4 to you!? i can buy a better amount for even RM1 at a random cut fruits stalls! WE FEEL CHEATED! at the end, we did not touch a single piece of those sliced watermelon. so instead of replacing the soup with fruits, u r wasting that plate of fruits. we questioned your staff, why were we being served with such sad looking plate of sliced watermelon? does this even justify to the soup? and guessed what we were being replied. IT WAS THE MANAGEMENT'S ORDER! A very sorry to you for the incident that you had experienced, we will feedback to the respective department and investigate this case internally. Thank you for your comment, because this can help us to improve our service. fine. it was still CNY. i gave more time. but today, when i want to follow up, my post was being deleted. i cannot find anywhere! "Best regards, Kim Gary Customer Service"? what sort of customer service is this? are you joking with a customer service who has been in the service line for more than 10 years? your company motto is "Make Customers Say Marvelous"? sure! MARVELOUS CUSTOMER SERVICE! so, dear management, now i am questioning you. are these your decisions? to serve customers with pathetic looking plate of watermelon? i totally understand if your instructions are to replace the soup with watermelon. but with sliced watermelon? seriously?